Companies need experienced help to develop a plan for a crisis, test the plan, and/or have the leadership to take them through a crisis. The Hopgood Group, LLC can develop that plan for you. 1. 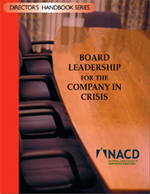 Board Leadership for the Company in Crisis provides a manual of steps to prepare for an unknown crisis as well as first day and continuing steps. 2. Crisis consulting, interim CEO, board member or board Chair of troubled companies. This 3,000 s.f., brown-stone townhouse with attached basment apartment is now available. CLICK HERE for more details. The Hopgood Group, LLC is a consulting company founded in 1985, assisting a variety of clients in working through difficult situations including federal investigations, liquidity issues, leadership changes, re-structurings, and product issues. We have taken a variety of roles including Chief Executive Officer, Chairman of the Board, Board member, consultant, and expert witness. Our clients have included Fortune 50 companies to small-cap public and private companies and have included companies with foreign subsidiaries, franchisors, manufacturers and a variety of industries. We are able to effectively identify risk and plan for risk mitigation and crisis planning. Or we can step into a crisis and assist in working it through to resolution. The founder, Suzanne Hopgood, co-authored the award winning "Board Leadership for the Company in Crisis". Winner of the Burton Legal Writing Award from the Library of Congress, this handbook guides corporate directors through the kind of planning that can save valuable time and minimize damage when trouble does arise. Copyright © The Hopgood Group,LLC All Rights Reserved.